Absolute Tai Chi champion of Bulgaria in 2003 after winning in three disciplines – form, short and long arms. Two-time winner of the World Cup in 2004 and 2005 in the short weapon discipline in the championships in Perugia, Italy. 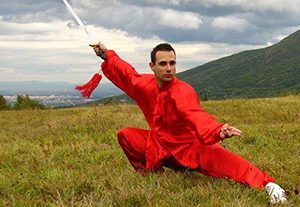 Peter Dragoev has been teaching Taijiquan (Tai Chi) to adults and children for over 15 years now. Founder and head of the “Black Dragon” Sports Club, Sofia. Tai chi is the art of movement. It is described as moving meditation. Tai chi strengthens and heals the body and the soul. An ancient method of connecting with our Higher Self. According to the philosophy of tai chi, physical balance is the key to inner peace. iInherently tai chi is a kind of self-defense martial art closely associated with meditation. But unlike other martial arts, it is based not on power and aggression but on peace and tranquillity. Tai chi exercises are a series of smooth and consistent movements called “Form”. These movements help our inner energy to move freely within us, harmonizing mind and body. Soothes and concentrates the mind. Increases flexibility, balance and control.